You are here: HomenextTransportnextTransport - shipsnextUSSR trawler in locks. A USSR trawler in Tilbury locks. How is your Russian Roger. Possibly a research vessel of some type. This is an interesting one, Jack. 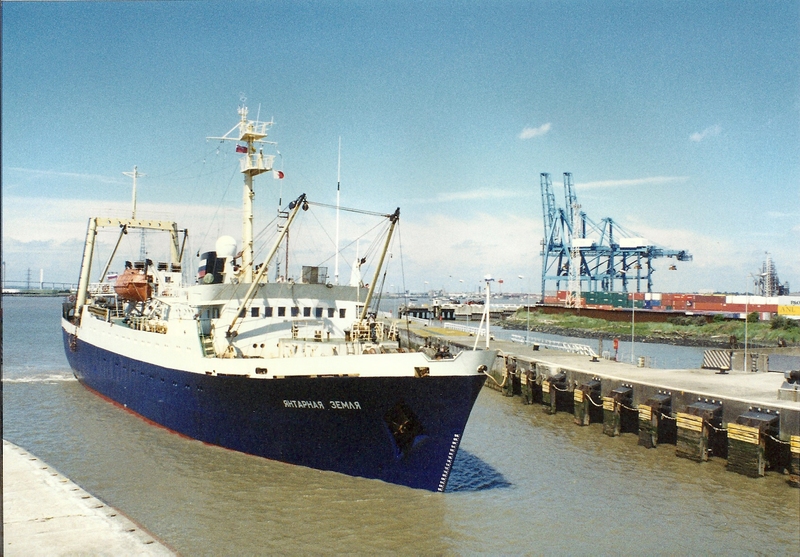 There have been very few Soviet-era factory trawlers anywhere in the port of London, and maybe this was the first to visit Tilbury. In response to your question, I started learning Russian in 1965, and while I don’t get much chance to practice it, I have no problem reading and writing it, and ship names are easily sorted, although sometimes what appears on the side of a ship does not match exactly the entry in the register. 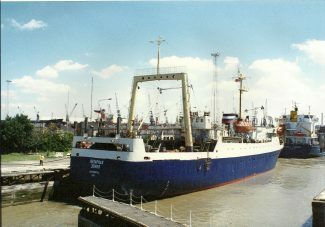 This is the factory trawler YANTARNAYA ZEMLYA (2581 tons gross), which was built at Nikolayev, USSR, in 1973, as one of a very large series of similar vessels which first appeared in the earlier 1960s. Its first name was DZINTARZEME under the USSR flag and operating for the fishing organisation Zapryba. 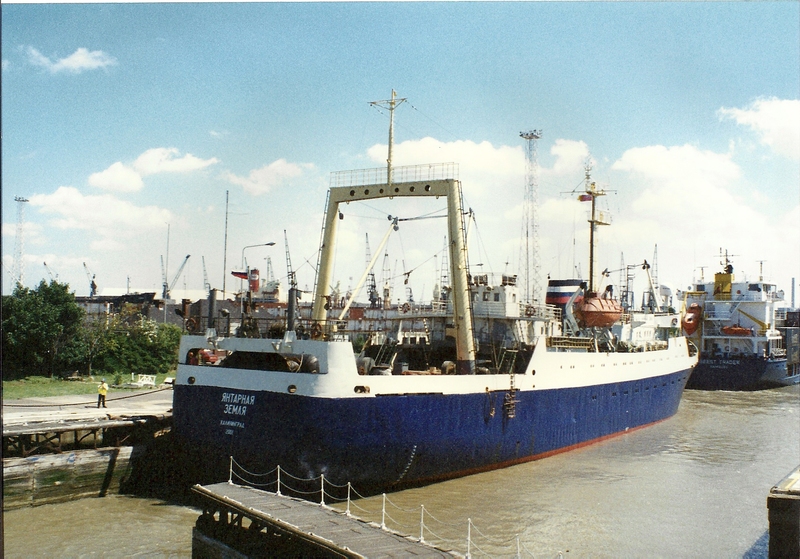 Following the breakup of the Soviet Union, in 1995 the vessel was transferred to the then newly-revived Russian flag and renamed YANTARNAYA ZEMLYA. From hereon, the trawler led a life that was a little secretive and it has not been easy to track down her owners, although it is fairly well certain that her ultimate owners have been “eastern European”. 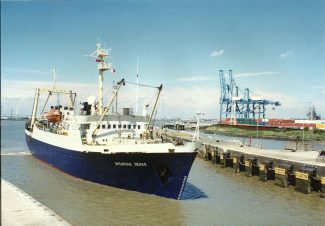 In July 2001 she was renamed OCTANT under Belize flag, in 2004 she became VEGA IV, still under Belize flag, and in May 2005 raised the flag of Cambodia under the new name LIRA. By this time her role was as a fish carrier and crew carrier. There is a suggestion that in April 2006, she arrived at Alang, India, to be scrapped, but this has not been confirmed. However, she has dropped off the radar since then, so the report might be correct. The last report I have for her was that she arrived at Lerwick in August 2005 to take on bunkers. It seems as if she spent much of her later years either fishing or supporting fishing fleets in the North Atlantic and North Sea areas. I do not know the reason why she visited Tilbury.